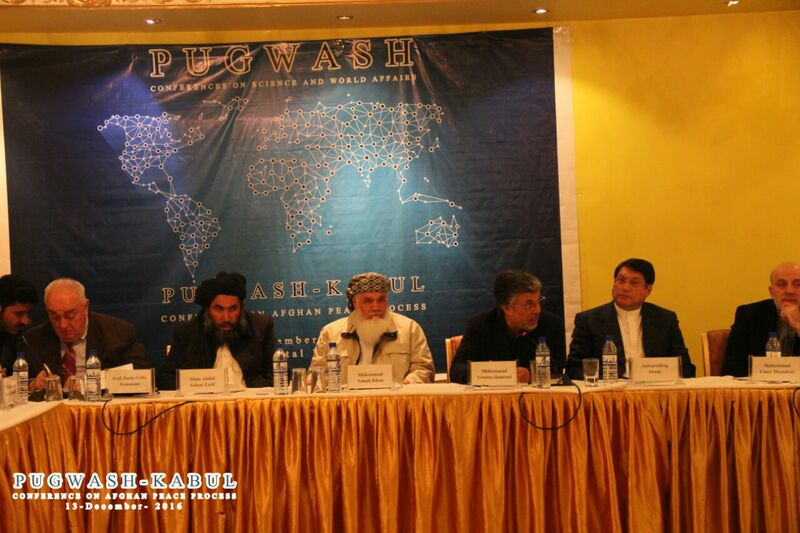 On 13 December 2016, a Pugwash meeting was convened in Kabul at the Intercontinental Hotel. The participants included around 40 political leaders of different orientations (see the attached list of participants). The purpose of the meeting was to discuss the prospects for peace in Afghanistan and the possibility of promoting an agreement with the Taliban, in light of the successful negotiation between the Government of Afghanistan and the Izb-ul-Islami party. One should note, however, that the Taliban, unlike the Izb-ul-Islami, control a significant part of the territory of Afghanistan. Among the items to discuss was the Pugwash Proposal for Peace in Afghanistan, which now consists of 19 points. The Pugwash proposal is intentionally a working proposal that should be further defined, adjusted and corrected by keeping in mind the various contributions to the discussion coming from both the Taliban and the various political leaders of Afghanistan. All the interventions stressed the general will and commonly shared desire of all Afghans for a lasting and stable peace in Afghanistan, after almost 40 years of war and foreign intervention; wars—as quite a few pointed out—that have been imposed on Afghanistan by various foreign and external forces. The presence of foreign forces, as it was pointed out, is in the long run “neither useful nor convenient”, and foreign forces should be eventually withdrawn from the territory of Afghanistan. Afghanistan should in the future cooperate with all countries within a peaceful framework, peace being essential for the economic and general development of Afghan society. It was said that it is a mistake to ask the Taliban to surrender. In the past, the Government had called upon the Taliban to lay down their weapons, while the Taliban stated that they wanted only to have discussions with the U.S. But a sharing of power with the Taliban is an important part of the solution of the Afghan problem. And an inter-Afghan dialogue is likely to produce better results. It was pointed out that the Government of Afghanistan should be encouraged to be ready to make compromises. The participation of the Government in this debate is obviously essential. In the words of one participant, “without the support of the Government, no peace negotiation will give positive results”. But it was also pointed out that, “even without the contribution of the Government, paving the way for peace is important, and impartiality is crucial”. It was also said that the Government of Afghanistan has a critical dependence on foreign financial support, which may not go on forever. It would thus be better to find negotiated ways out with the Taliban. It was also pointed out that the international community should contribute in an essential way to the peace process. The Taliban should not at all be considered as terrorists but rather as a political component of Afghan society. The Taliban have reiterated in many ways that they want peace and a sharing of power, and not a monopoly of power. They recognize human and women’s rights, and this is a very positive element. But how to define a power-sharing mechanism is still to be properly understood. The possibility of an interim Government is mentioned in the 19-point peace plan. Many people questioned this idea on the basis of different assumptions. Should the definition of an interim Government mean that “we have to start from zero”? Is this a feasible option? The duration of an interim government (before new elections) is also a question mark. And what would be the attitude of the present Government? And should we consider only “two parties” (the Taliban and the present Government) in the definition of the interim Government? Instead of an interim Government, one participant proposed a “national partnership Government,” but the exact definition of this concept needs to be properly understood. A ceasefire was considered by everybody as a necessary condition to transform the antagonism between the Taliban and other Afghan groups into a political confrontation, and an essential step towards peace. In the areas occupied by the Taliban, the Taliban should not be evicted by force (after a ceasefire). But many participants expressed concern that this would imply splitting Afghan territory into zones controlled by different groups. The unity of Afghan territory is a very common concern, and everybody agreed that this unity should not be jeopardized in any way. Preserving the unity of Afghanistan, and avoiding, in particular, the splitting of the country along ethnic lines, is a top priority for all Afghans. Respect for the rights of all Afghan ethnic groups is an essential element for peace, it was pointed out. The possibility of forming various Jirgas was mentioned several times. Reference was made to both regional Jirgas as well as to National Loya Jirga. A constitutional Loya Jirga was also mentioned in reference to a possible change in the constitution, a desire expressed on several occasions by the Taliban. The Taliban should have a political address in order to facilitate communications. They should be able to travel and discuss with other Afghans. The 19-point peace plan was generally considered a good proposal that should nevertheless be further clarified, amended, and corrected. The participants in the 13 December 2017 conference support further discussions of the peace plan, and of the prospects for peace. The contributions to the discussion coming from the Taliban continue to be of great importance because they are essential to finding a solution for peace in Afghanistan; it was also pointed out that the Taliban can make an important contribution to countering the presence and influence of Daesh. The Taliban should become a legitimate political party.